Pranic Healing is a technique based on the scanning of the energetic body (as a diagnosis), the removal of excess energy, if any, and on the energization of areas with deficiency. From Basic Pranic Healing evolved Advanced Pranic Healing, Distant Pranic Healing, Cristal Pranic Healing, Psychic Self-Defense and Prosperity Techniques. It is a fast and efficient method to treat physical, psychological and spiritual disharmonies. Pranic Healing is an ancient science and art which was systemized by Grand Master Choa Kok Sui, born in China and established in the Philippines. It was introduced in Brazil in 1992. Pranic Healing aims to equilibrate vital energy and chakras, channeling Prana, acting on the bio plasmatic body with physiological results, in other words, advancing the healing. The physical body of human beings is composed by two parts; the visible and palpable physical body and the bio plasmatic body, made of a subtle and invisible energy. These bodies pervade and interact, exchanging energy. We are nourished by vital energy – also known as vital force, Prana, ki, pneuma, mana, ruah – from this fountain called the Universe in its natural manifestations: air, earth and water. We have centers for the captation and irradiation of energy, the Chakras. When these centers are not equilibrated, they do not attract energy, therefore wasting vital energy or Prana, which is necessary for our physical, mental, emotional and spiritual health. Having the knowledge of the energetic process, the Pranic Healing facilitator locates the instability and removes the deleterious Prana replacing it thereupon with pure and healthy Prana from the air, equilibrating the energetic body and as result, the physical, mental and emotional bodies. It is a service practiced with knowledge, without any reason for mystification, given its logic and simplicity. The results may be verified right away or little by little, depending on the physical and energetic committal of the patient. Those who are feeling weak and without energy tend to absorb Pranic energy from those who have it equilibrated, whence we feel tired and exhausted without any apparent reason when we get in touch with them, as they act unwarily (or intentionally), as real “energetic vampires”. As a result, we feel the unwholesome symptoms carried by patients when they come to us. We must have the knowledge of self-help techniques and look for professional therapists like Pranic Healers to keep the energetic balance. Likewise, people with good Prana often make us feel good and they are the center of groups of individuals who benefit from their energetic power. Those people must visit sick people of all kind. Learning how to handle that energy source to help people or to help oneself is really worth. The ingestion of fresh, natural food matches the knowledge that the more natural food we take, more vital energy will be circulating in our organism as an extra source. Processed food takes a long period of time from the extraction to its ingestion and goes through chemical conservation processes and/or through high temperatures – is energetically void and often without any nourishing value, good enough to give the feeling of physical satisfaction. Dead animals loose the vital energy very fast, and do not provide much in terms of energy to those who use them as food. Vegetables maintain that energy longer and provide a pranic support to those who consume them, increasing the circulation of the bio plasmatic body which recovers potential wastes and avoid sickness. Human being, regarded as a unique and total being – the holistic view – has its physical, mental, emotional, spiritual and energetic functions interconnected, influencing each other. As a result, the different diseases are usually the outcome of these unbalanced factors. By equilibrating those functions we avoid the sickness process caused by external or internal factors. A clear example is the gastric ulcer, mostly caused by emotional factors like stress, fear, the pressure of society, without a relief valve, swallowing unwanted things, the detachment from a more natural life, etc., which weakens the solar plexus chakra – located by the stomach – which propitiates the invasion of bacteria on its walls, provoking wounds. In this case, all the patient’s bodies are impaired and it is necessary to work on the awareness to revert the symptoms. The treatment with medicaments – natural are better – the removal of the external cause of stress, changing the mental attitude to face the problems, the relief, fresh, natural and balanced food, the energetic equilibrium provided by Pranic Healing and the sustenance of the acquired health are synonyms of permanent healing. Through the exploration of the aura, Pranic Healers have the possibility to identify the disease, found first in the auric field and later in the physical body. 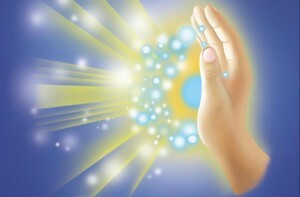 Pranic Healers, also known as Pranic Channelizers, use scanning techniques to measure the vital energy of the patient, cleansing the auric field and the Chakras, absorbing and channeling of Prana emitted by the hand and finger chakras to the patient. Pranic Healers also use white Prana, or color Prana for each different case, crystals, visualization, directing, etc., which enable them to act in any given situation, from the most simple, to the most complicated disease. The human body is composed by 99.99% energy and 0.01% mass, it means that if it was possible to compact it, the body would be reduced to a microscopic particle. But within such a big space move almost chaotically, for our actual comprehension, the electrons and other atomic sub particles around the proton or nucleus, producing energy inside our bodies. Everything that exists in the Universe is energy, therefore our sub atomic particles (smaller than the atom) are closely connected with cosmic energy. These electrons, part of any atom, are constantly moving, jumping from a lower orbit to a higher orbit, to absorb energy, then returning to the lower orbit to release the energy recently absorbed and move further from its original location. Now, the result is a photon (energy in the form of light), which might be the multicolor light that we see in a Kirlian photograph. When there is any perturbation on the energetic circulation, in other words, a blockade, the electron, instead of jumping to the right orbit, it goes to a different orbit, which means more attrition, affecting the molecules, the cells, organs or systems of the human body, which consequently will suffer alterations, first of the energetic and emotional type and then, of the functional type (at this stage, even if we make laboratory tests, x-rays, magnetic resonance, ultrasound, etc., the results would be quite normal). Finally we have the alterations in the form of lesions, and the anomalies show in any of the above mentioned tests. Logically, to reach this stage is not exactly the doctor’s merit, who ought to have foreseen the way to avoid it. If the ethereal body or aura suffers alterations, they will appear in the physical body, as diseases, first emotionally, later functionally and finally in the form of lesions. The energetic disorders of the aura often come forward 5 years before they show up in the body; therefore, we envision the importance of cleansing and energizing this vibrational body to avoid the disease in advance. Pranic therapy can be included amongst the bio energetic or vibrational medicine, since it transmits bio magnetic energy through the healer’s hands, who takes the energy from the surrounding environment to try to reestablish the normal energy flow, first in the bio plasmatic or subtle body or aura, and then, acting on the physical body through the law of correspondence and healing the patient in such a simple way (and at the same time, complex). Pranic therapy means, a treatment or therapy using prana. Prana for the yogis, chi for the Chinese, ka for the Egyptians, is the universal energy that comes from the air, the sun, the earth and from cosmos. It is also the vital energy of homeopathy genius Cristian Samuel Federico Hahnemann, it is the energy we use for Pranic Healing, where the healer acts as a channel, transmitting this pranic bio energy through the patient’s chakras using an ancestral technique. The chakras are vortexes or whirls that absorb higher energies or prana and later transmute them into lower octaves, that is, lower energetic vibrations for the body to use, making physiological and hormonal changes in the physical body. However, if we have energy blockades along the nadis, they will disturb the normal flow or course of bio energy through the body. Nadis form a thin, subtle web, estimated in around 72,000 channels or nadis, developed and interwoven like a net, as invisible filaments around the physical nervous system, and due to its close interconnection with it, they affect the quality of the transmission of nervous impulses in the cerebral, spinal and peripheral systems. After a period of modern obscurantism, produced by an exaggerated and monopolized overrating of science, seeing to believe, fortunately and thanks God and the spiritual hierarchies to which human being is turning to more and more, to those centuries-old sciences, so known in the past, they had to remain in a state of inaction for most of human kind. Each day, more and more patients seek advice on this subject to adopt it as a unique therapy, or to support official allopathic or alternatives treatments. The practice of Pranic Healing does not imply to abandon the doctor at all, but on the contrary, it can help to facilitate and magnify the healing process, to add, not to subtract is the best indication in this era of illumination, where at last, elaborated surgical techniques may join sophisticated diagnosis methods, at the same time, with vibrational treatments and Pranic Healing, that from my point of view, is taking shape as one of the actual bio energetic pillars, I mean it not by its chronological age, since it comes from the night of times, but because of its actual utilization, as a preventive and healing therapy. Let us remember – and we will come back to this in successive articles – that our bodies are composed by a physical body, that we see and touch, but there are also other bodies like the etheric or subtle or bio plasmic or aura, astral, mental, instinctive, intellectual, spiritual, and finally the causal body, seat of our physical body. Our intuition always indicated the existence of something beyond what our eyes could perceive. There are several ways to enhance our senses to reach a higher level of consciousness. Pranic Healing is one of this ways and we do not need to give up our rational thinking or real world to follow it. As a matter of fact, it is all the opposite, it will help you day by day. Not only regarding physical and emotional health, fighting diseases, stress, depression, insomnia or vices, but also helping to materialize goals, improving the concentration or making the learning process easier. So, what is Pranic Healing? Pranic Healing is an ancient treatment of oriental origin which uses prana to further the equilibrium. And what is prana? It is the Sanskrit word for “breath of life”, the vital energy which is present in all planes, it is invisible, without aroma, weight, sound or taste. It is something abstract and concrete at the same time. Master Choa Kok Sui, after many years of studies, research and experiments, systemized the procedures of healing and prevention clearly and simply. We learn how to sensitize our hands to feel and direct the incoming energy to store it in the chakras (the Sanskrit word for wheel). They are small colored whirls, mainly located between the head and the base of the spine that control the inlet and outlet of vital force. All the chakras are connected not only to the organs and functions of the organism but also rule over the emotions and make a link with the spiritual world. When they are equilibrated, those centers allow the energy to flow in a healthy way. When they are weak or over activated, they may provoke blockades, difficulties, illness and low immunity. Pranic Healing help the body’s energy system to normalize, so that the body is able to heal by itself. Since it considers the person as a whole and it goes directly to the source of the diseases, Pranic Healing has good results both on the prevention of the diseases as well as a complement of traditional medicine. Are we all capable to learn and practice Pranic Healing? Yes, this technique developed by Master Choa Kok Sui is simple. With our bodies composed of 70% water, which is an excellent electricity conductor, we are naturally able to syntonize and transmit subtle energy through the hand chakras. How is a Pranic Healing session? During the session, the patient can sit, lie down or stand upright, depending on the part of the body to be treated. The healer always keeps the hands at a certain distance from the patient. First, the healer determines which chakras are unbalanced, then he/she makes a cleansing and harmonization, giving prana according to the needs. The most experienced healers are able to practice distant healing and to handle a wider range of subtle energy. The work of Master Choa Kok Sui is not limited to the development of healing techniques. Being a great scholar of ancient practices and of Hindu, Chinese, Tibetan and Egyptian philosophies, he made a profound study of the occult teachings of Jesus Christ, the Kabala, Sufism and alchemy. Master Choa Kok Sui helps us to connect with different types of knowledge and to perceive its common nature. The spiritual essence of mankind surpasses the sectarianism of religions. Through the practice of reflections and meditation, we unveil the divinity inside of us. We are part of the same supreme energy that created the Universe; therefore we must experience harmony, not only with peace amongst the peoples, but also to overcome the small obstacles daily.